Safety tips for Christmas time! As we head into the festive season and look forward to relaxing with family and friends, it’s a good time to give some thought to keeping our pets safe as they join us in the fun festivities! Chocolate, plum pudding, Christmas cake, fruit platters and delicious roasts and stuffing. What could possibly be wrong with sharing that! Unfortunately, these Christmas goodies can contain ingredients that are toxic to dogs, including chocolate, sultanas, grapes, raisins, onions, garlic and macadamia nuts. Signs will depend on the food that has been eaten and can be delayed. For example kidney damage from grapes and raisins may not become apparent until weeks down the track. If your dog has eaten something they shouldn’t have, please speak to a veterinarian immediately. This is a no-brainer really but there is NO safe amount of alcohol for your dog to have. Effects will range from depression, difficulty walking, slow breathing, collapse and even possibly loss of life. Just a little bit of ham can’t hurt, right? Well, a little here and a little there adds up! 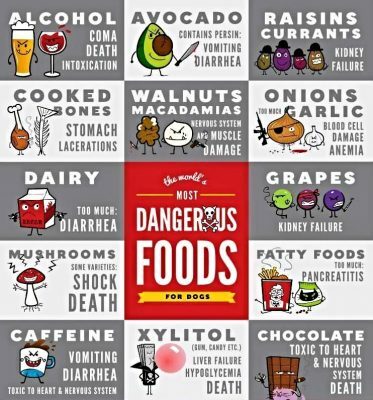 We love to treat our pets but we need to remember that a little to us can be a lot to them, and eating too much of something different or high in fat is a very common cause of illness for them. Overindulgence can trigger stomach pain, vomiting, diarrhoea and even pancreatitis (which can be fatal). Feeding cooked bones should always be avoided as these can cause bowel obstructions and constipation requiring intervention. Don’t risk your dog getting treats from the BBQ or scavenging from finished plates. If you can’t ensure your guests will resist your dog’s pleading eyes, then you are better off to have your dog safely out of their way! You need to take control here on behalf of your pooch, because they are not going say no! 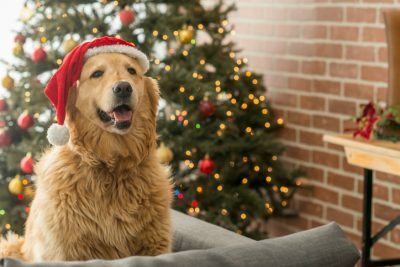 Parties, fireworks and summer storms make Christmas time hard for dogs who are prone to anxiety. Nobody knows your pet better than you do. Always observe your mate closely and look for the subtle signs that they are worried, and take action. Avoid the stressors where possible, and make sure they always have access to a quiet, safe retreat. Some pets will benefit from judicious medication to get through this time unscathed. Please call us if you would like to discuss. Now, we’re not saying don’t have one! We like the festive fun as much as anyone, but here are a few things to consider if you do. Tummy upsets after chewing pine needles or drinking stagnant Christmas tree water. Electrocution is a risk if your pooch starts chewing the Christmas tree lights. Obstruction or injury to the bowel can occur if tinsel, other decorations, wrappings or ribbons are eaten. So to make things easy, here’s a checklist on how to make your Christmas tree dog-friendly this year. Cover or box around the tree stand. Plastic cover the electric cord for the lights. Secure the tree so that it can’t easily fall. 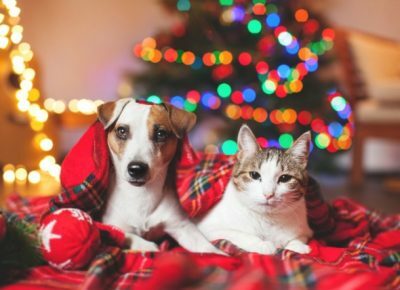 Popular Christmas plants and flowers such as poinsettias, amaryllis, lilies, hibiscus, Christmas cactus, berries, mistletoe and holly leaves are all poisonous to your pets. Make sure they are out of their reach, as consumption could result in illness or even death. Swallowed batteries are very dangerous for dogs, causing a range of issues from burning their gut to a life-threatening obstruction or stomach rupture! Batteries are a common addition to Christmas gifts so please ensure they are kept well out of reach of your pooch. Many toys contain small plastic, rubber or metal parts that, if eaten by a dog, can cause choking or dangerous gastrointestinal blockage requiring immediate surgery. We wish you and your furry family happy and safe holidays! Reference to an article by Dr Claire Jenkins Co-founder of Vetchat. The days are getting longer and the temperature is getting higher here in the Nation’s Capital. What a perfect time to get out and about with your dog. Now more than ever our dogs are truly a part of our families, from tagging along with us to our favourite local cafés to enjoy a puppachino to getting us out of the house for a stroll around our neighbourhood or a play at the local dog park. 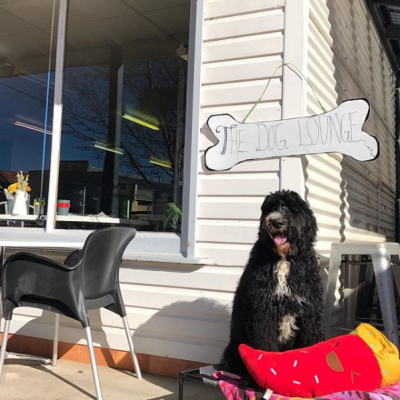 Here is your guide to Dog Friendly Canberra! Check out the @puppersofcuppers on Instagram to see all of The Cupping Room’s canine vistors! Click in an area to load an interactive map of nearby off-leash and dog-prohibited areas. With obstacles and and furry friends a plenty, Forde dog park is a must do for you and your furry friend, but of course, not without following Dog Park Etiquette (see video below). 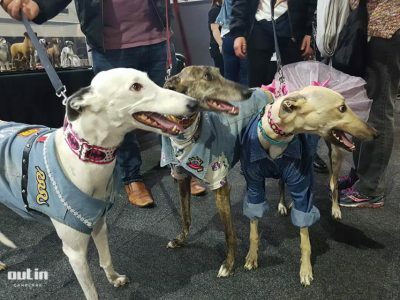 Every year Canberra dog lovers and their pooches get their very own boutique indoor event packed with everything form the Doggie Mall to High Tea with dogs, stage performances and breed specific play dates! 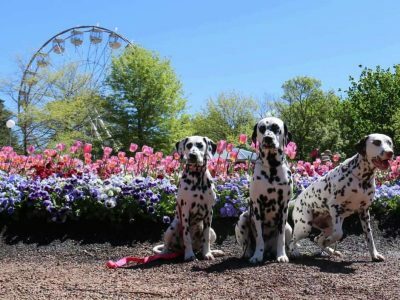 Canberra’s canines unite to enjoy the beautiful bulbs at Floriade on Dogs’ Day Out. Dancing with dogs and Flyball are just two of the many demonstrations not to be missed on the day, as well as the best dressed dog competition with this years theme of Superheroes. 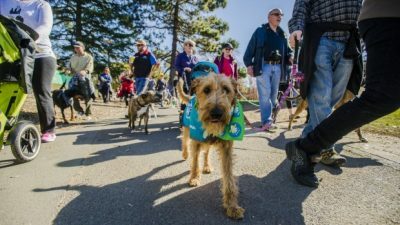 Every year thousands of Canberra’s animal lovers get together and walk the way to a better future for animals in need. 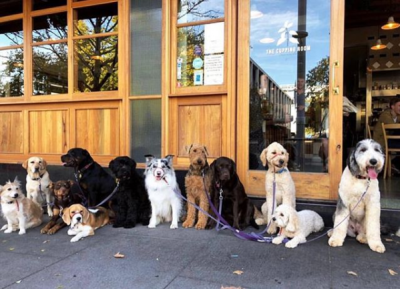 Head to https://www.meetup.com/Canberra-Dog-Walks-Meetup/ for details on dog walk meetups near you. Measuring a resting respiratory rate, or sleeping breathing rate, is an important way that you can help monitor your pet at home. It is an invaluable way that you can help us care for your pet. What is a resting respiratory rate? A resting respiratory rate is a count of the number of breaths taken per minute. In dogs and cats with heart disease, it can be one of the first signs that heart failure is starting to develop. Early detection of this change can help prevent severe breathing problems. When do I need to take one? For dogs and cats with heart disease, we will often ask you to measure the resting respiratory rate a few times over 2-3 days to establish a baseline. After this, we will recommend monitoring this rate 2-3 times a week. Normal dogs and cats will have a breathing rate in the high teens to early twenties. We become concerned when we are getting resting respiratory rates that are over 30. If you notice this it is important to contact us immediately so that we can help. 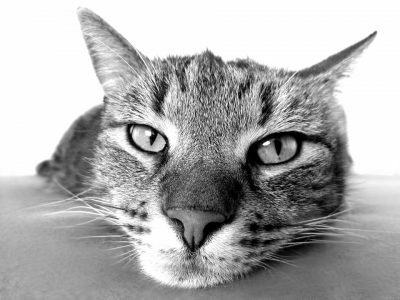 How do I count my pet’s resting respiratory rate? It is important to take this measurement when you pet is sound asleep. Wait until they are resting quietly. When you are watching your pet you will notice that the chest rises and falls as they take a breath. This is what we need to count. As the chest moves in and then out, this is counted as a breath. Use your phone, a kitchen timer and count the number of breaths in 15 seconds. Then multiply this number by 4. Alternatively if it is easier count the number of breaths in 60 seconds (1 minute). It helps to keep a diary/record of your pet’s breathing rate. You can even download some apps that will help. Have a go at counting a resting respiratory rate – the video below goes for 15 seconds. Notice how the dog is sound asleep. Count the number of breaths in that time, and then multiply it by 4. Did you get 40? Behavioural problems in senior pets can result from medical issues like arthritic pain, loss of sight/hearing or diseases that affect the nervous system. They can also be attributed to age related deterioration of the brain known as Cognitive Dysfunction Syndrome. In mild cases the pet may sleep more, become less responsive or show less social interaction with family and other pets. More severe signs might include repetitive behaviours such as pacing, new fears and anxieties, house soiling, waking at night, confusion and disorientation or loss of recognition of training cues. The behaviour changes may be noticed following changes to the household or environment that the pet has difficulty adapting to. Early detection provides the best opportunity to help these pets and slow cognitive decline. Prevention: What can you do? 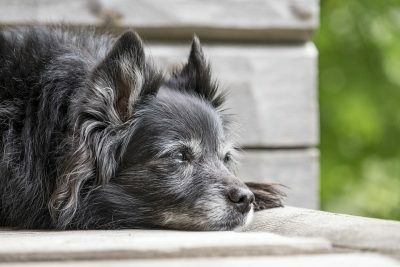 For healthy senior pets, twice-yearly wellness examinations and laboratory screening tests provide an opportunity to identify emerging problems, sometimes before there are outward signs. Report changes in your pet’s health and behaviour to the vet early. If you foresee changes in your pets environment or schedule, try to make these gradual so you elderly pet has time to adapt. Providing mental and physical enrichment helps to maintain a healthy brain and body. If your pet begins to slow down, find new games, new toys and new ways to play to stimulate the brain and keep the body active. Play and exercise help most if continued throughout life and adjusted for age related physical limitations, for example supported swimming for arthritic dogs. Leash walking exercises muscles and provides mental stimulation via smell and social interactions. Use a harness, sling or pram/stroller if they can’t manage walking. Take a ‘sniff stroll’ rather trying to cover ground. Trim nails and hair under their feet for a better grip. Supervise play and pick mates matched by temperament, ability and size. Redirect the new puppy play if your old pet tires. Watching play may be enough. Car trips are fun for some dogs. They enjoy the tactile sensations of the breeze, the smells and company. A ramp may be needed for access and comfy padding in the vehicle to cushion old joints. Take care in warm weather to prevent overheating. Be creative in seeking ways to make it easier for them. Elevate the water dish to shoulder height; warm food and add water/broth to food to increase palatability and water intake; give cats more litter trays for convenient access and cut down tray height; set up ramps to reduce the need to use stairs; cats benefit from stepped platforms leading to high perches; have the cat/dog flap at floor level; use hall runners or a paw friction product to provide grip on slippery floors; add psyllium to the diet to reduce constipation; clip heavy coats and matts for freer movement and summer comfort; provide a winter coat if they feel the winter chill. Cats benefit from lower litter trays and ramps to their favourite places. Smell provides great mental stimulation. Provide food puzzles and hidden treats. Visit unfamiliar places. Hand signals or vibrating (NOT shock) collars can be used to communicate to deaf dogs. Lavender scent trails can guide the blind. Practice massage and range of motion exercises for sore legs. Treating problems: How can you help? Medical problems need to be identified and treated, however retraining may also be required. For example, if your pet begins house soiling due to a medical issue, the problem may persist after the medical issue is resolved unless you use positive reinforcement to train the pet to return to the preferred locations and supervise access to the soiled areas. For problems that cannot be completely resolved, you may need to make schedule adjustments to accommodate your pet’s needs. For example pets with kidney disease need to urinate more often so you may need to take your dog out to the toilet more frequently or reward them for using training pads. Provide extra litter trays or clean the litter tray more frequently if your cat urinates more due to kidney disease. Maintain an enriched environment that stimulates your pet’s brain and body. Adjust their social play, exercise and training according to their health. Use their favourite food and toys to train new cues, practice previous training and play games of hide and find. Food release toys that provide manipulation to obtain the food or treats provide a challenge to stimulate your pet’s mind. Medications can be prescribed to improve neurotransmitter function and brain activity or act as antioxidants. Medication that reduces physical pain, for example from arthritis, can allow your pet to enjoy more physical and mental activity. A prescription veterinary diet is available containing antioxidants and fatty acids that reduce signs of cognitive decline by improving neurotransmission. 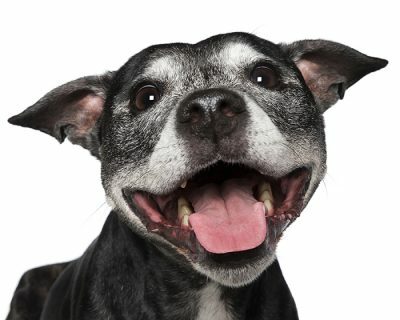 It has been shown to help old dogs stay active, enjoy interactions, reduce sleep disturbances and retain house training. Many natural products are touted to be effective and your vet will be able to advise you on supplements that may be useful. please phone us on (02) 6230 2223. It’s amazing the things that dogs will eat; we see dogs that eat toys, clothes, sticks, whole bones and so much more. Theodore is one of such dogs who is quite the scavenger, he is known to eat all sorts of things that he probably shouldn’t! He came in to see us because his owners noticed that he had been vomiting quite a lot. Theodore is very lucky that his fantastic owners were on top of it because this little man had an unknown object or ‘foreign body’ stuck in his intestine, a life threatening condition if left untreated. 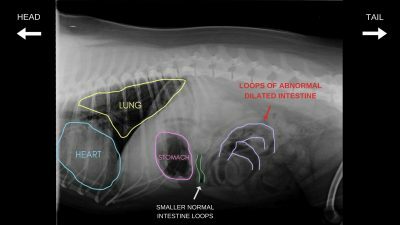 Having already known that Theodore has a tendency for eating things he shouldn’t, we knew that one of the first things we needed to do was take an x-ray of his abdomen. Sometimes x-rays will show the foreign body, other times we need to rely on gas patterns, ultrasounds, or repeat imaging to find them. In Theodore’s x-ray below you can’t see the foreign body itself, however you can see that some of his intestine is small and narrow while other parts are wide and dilated. This shows an abnormal gas pattern, there is gas building up in parts of his intestine rather than moving through. This indicates that there is some sort of obstruction stopping the gas in its tracks. Theodore then went straight into surgery, where we removed the offending object. It had caused considerable bruising to the intestine, but luckily the damage was reversible. On occasion if the damage is severe enough we have to remove part of the intestine luckily though, this wasn’t the case for Theodore. Theodore was transferred to Canberra Veterinary Emergency Services to be monitored overnight and returned to us the following day for post operative monitoring. Theodore was bright, happy and eating and was then ready to return home to his loving family. Unfortunately we know quite a lot of repeat offenders, some dogs (and cats) have been known to go back for seconds and even thirds so it is always important to pet proof your house! Want more? You can read Harriet the 11 week old Cattle Dog’s story HERE. 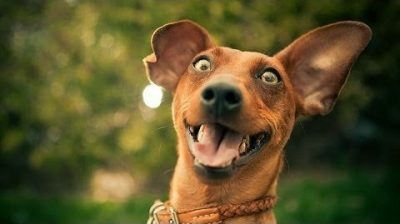 Excitable dog behaviour such as jumping on people and mouthiness are very common behaviours, especially amongst young dogs. While a Chihuahua pup might not cause much damage when it jumps at your visitor, the hurtling missile of fun in the shape of the adolescent Labrador can cause injury. 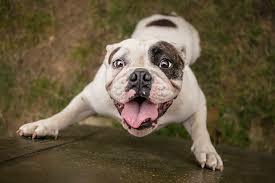 Jumping up, attention barking and even mouthiness are often linked to the pet’s level of excitability. Times of high arousal lead to excitement and frustration in the pet – so daily greetings, playing, requesting food or meeting someone while out on a walk are all triggers for an explosion of inappropriate behaviours such as jumping up and mouthiness. These behaviours can be given a safer and more appropriate outlet. If your dog jumps up to greet you, how about teaching a totally different behaviour, such as to retrieve a toy, sit calmly and give it to you. That then gives the excitability an outlet and means that the dog has something in its mouth other than your hand. A pup’s choice of tool for investigating and interacting with the world is its mouth. They’ll use it to explore everything including grabbing your fingers, hands, arms, clothes etc. If you squeal when they nip you this can be misinterpreted as a game, with you as the squeaky toy. To prevent this, make hand movements around dogs slow. Also, resist the urge to roughhouse play with your dog using your hands — and ALL members of the household need to adhere to this rule. Provide appropriate chew items for your dog such as raw hides, raw carrots and chew toys. For dogs that bark for attention, immediately withdraw your attention by turning your back on the dog. Saying ‘No’ to the dog in this instance actually rewards the barking as the dog can just as easily interpret the ‘No’ as ‘Hello’. Dogs are masters of body language, so removing your facial contact with the dog is far more effective at diminishing this behaviour. However, remember that you still need to reward the desirable behaviour. When your dog is quiet, reward that with calm, low key praise. Some dogs seem to understand what is expected more easily than others. At Hall Veterinary Surgery we can help you with these problems through personalised training strategies and behaviour consultations. Our website has a range of help sheets for you to download, or you can have a chat to a trainer or our veterinary behaviourist by calling us on 6230 2223. Early learning in puppies and red flags for mental health. When we welcome a dog or pup into our lives, we have certain expectations about how they should behave and fit into our family life. As social creatures able to bond with humans, dogs have co-evolved and shared our lives for thousands of years. However, each pup’s survival within their human family is dependent on them displaying desirable behaviours. What affects your pup’s behaviour? The behaviour your pup chooses at any particular moment is affected by their genetic make-up, what they have learned and their current situation or environment. Genetic make-up is not just about breed. In fact there is more diversity in behaviour between individuals or family lines within a breed than between different breeds. 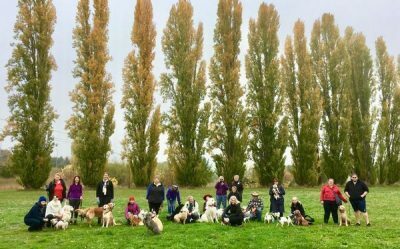 Learning has a huge impact on the behaviour choices your dog will make and there is so much we can do to teach our pups to grow into ‘good citizens’. We can provide positive opportunities for them to adapt to all the weird and wonderful things in our world and use rewards to help them associate challenging situations with good things. When does your pup’s mental development start? From birth to adulthood, you puppy’s brain is undergoing intense development. Even in the womb, a pup’s development can be compromised if their mother is suffering environmental stress. Right from the beginning, the pup is learning how best to survive in their world. The first hundred days is a crucial period when they will most benefit from positive exposure to the stimuli that make up their world. They must learn how to socialize to other dogs and people in these early weeks to be suitable companions. In the normal pup, there is a pruning of neurons in the brain over this time that helps reduce overwhelm and over reactive behaviour. This helps them learn what to pay attention to and what they can safely ignore. 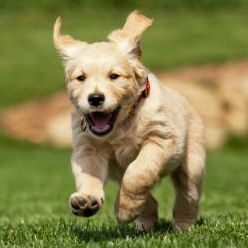 A pup’s early experience during the socialising period affects resilience or coping capacity. A small amount of stress like being gently handled is important in developing the ability to bounce back from stress later on. However, if faced with too much stress or too many choices, the pup will turn their attention away from the world around them and shut down to learning about their environment. Pups raised in isolation or impoverished environments are also more susceptible to becoming anxious and need early interventions to help them feel safe in the real world. At two-three weeks of age, pups benefit from a moderate variety of textures and structures to enrich their environment and promote development. 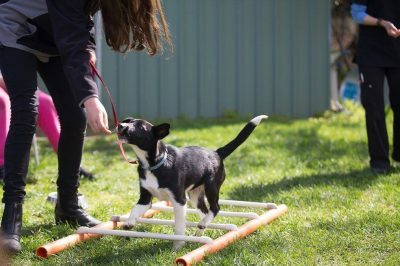 From three to twelve weeks, pups learn through play about their social structure and natural bite inhibition. They are very receptive to new experiences at this time, rapidly socialising and learning to accept new objects and situations. 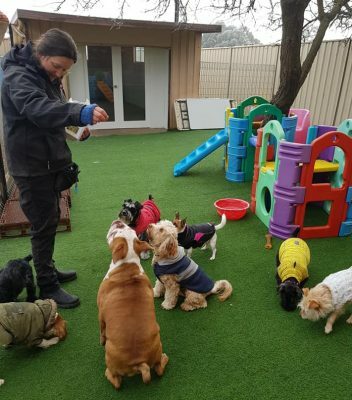 Introduction to other breeds is important at this stage and puppy preschool is a great opportunity to do this in a controlled way. A fear period between eight and ten weeks is a time when a traumatic experience can outweigh positive exposure and cause lasting fears, so it is important to provide environmental enrichment without overdoing stressors. Resilience will vary greatly with genetic background, however the trauma of shipping pups to new homes at this age can sometimes result in lasting emotional damage. Pups left in impoverished environments without the opportunity to explore their world by fourteen to twenty weeks will not voluntarily do so and can become terrified and distressed if forced out of their comfort zone. Early social intervention is essential to help pups develop resilience and normal behaviour. The age of separation from mum is another important consideration. Pups separated from mum when only 30-40 days old grow up to show more destructive behaviours, barking, fear on walks, reactivity to noises and food/toy possessiveness than pups weaned after two months. The home environment of the pup can also be a risk factor to puppy mental health with those pups in an enriched home environment generally fairing best. How do we recognise anxiety in a little pup? We need to learn to recognise dog body language. Pups that are fearful can show yawning when not tired, panting, ears back and lip licking. They may be withdrawn and non-social or anxious when left alone. Living with stress has an impact on both mental and physical health. Early intervention is key to helping pups develop the resilience to cope in our world. Identifying problems and early treatment increases the chance of success as pups don’t tend to grow out of fear. Treatment is divided into environmental management, behaviour modification and in some cases medication. Dog appeasement pheromone can also be helpful to calm these pups. Diets rich in fish oils (EPA and DHA), taurine, Vitamin E and L-carnitine can assist neuronal development and learning. Physical and mental stimulation with sensory cues like games to sniff out things and puzzle solving can help to develop cognitive ability and lower reactivity. We can help pups develop the ability to be calm on cue through rewarding calm behaviour in varied and stimulating environments. Please don’t hesitate to call us on (02) 6230 2223 if you are concerned about your puppy’s development. ‘Velcro’ dogs as they can be known, always want to be super close, even touching their owner in case you go away. This is a joy when you are with them, however some dogs can’t be left without getting upset and will bark continuously or destroy property (or themselves) in an effort to find you. Separation distress is a condition that results from anxiety. Other common anxious behaviours in dogs include fear of noises, situations or unfamiliar people or dogs. Anxiety is a fear of perceived threats. We know they are safe at home without us, however your dog may be completely unable to cope without the company of family members. Much of the time, it’s human rather than canine company that they crave so getting another dog is rarely the answer. Separation distress occurs in up to 15% of dogs and studies have shown that up to 80% of dogs have an increase in their stress hormones when alone. The desperate ‘nuisance’ barking or expensive destruction of property account for many pets being relinquished to shelters. Why do some dogs suffer separation distress? Various theories have been put forward for the dysfunctional attachment to owners or the fear of being left alone. Genetics can play a part, however the most powerful predictor is separation from an attachment figure early in life. Pups can readily transfer their attachment from their dam to their new human owner’s care, however, they need attention when young in order to grow up independent. The risk is greater in pups of single owners as they are alone more. There is an increased risk when owners are anxious when leaving the pup and make a fuss when they return. Dogs with a shelter background are more at risk as they have often lost confidence in attachment figures. When does separation distress start? The onset usually occurs before two years of age. It can follow the loss of a human or animal companion, moving house, a change in the owners schedule or a stay away from home in boarding or hospital. It can also occur along with other anxiety based behaviours, like noise or thunderstorm fear. What are the signs of separation distress? These signs only occur with separation, however some dogs cope with predictable regular departures but panic with unexpected departures. Most dogs show signs within 10 minutes of departure. Destruction of property. This is a desperate attempt to escape the barriers to finding you. Most often the damage will be around windows, blinds or doors. Other dogs will chew anywhere in the house in an attempt to cope with anxiety. Barking and whining are also attempt to communicate with you. Urination with or without defecation in the house. Increased grooming that causes hairless, ulcerated areas on the skin. Severe fear signs include dilated pupils, salivation, vomiting and inability to eat when alone. How do I know this is anxiety related? 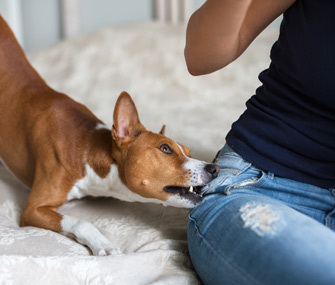 Destructive behaviour can also occur with normal puppy chewing or exploratory behaviour, particularly if the pup’s needs for mental and physical stimulation are not met. 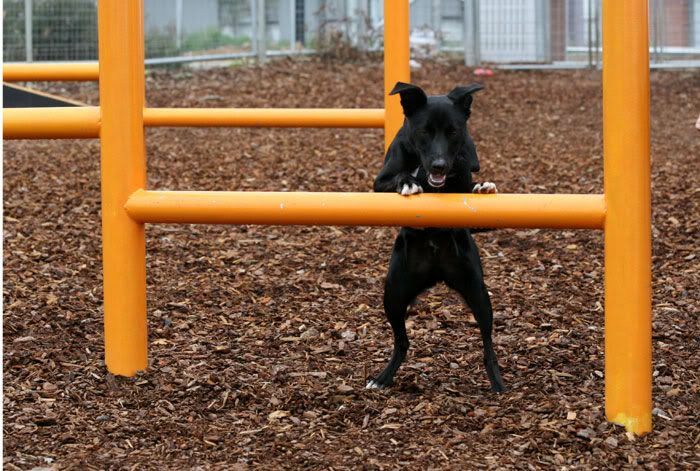 Some dogs destroy barriers when they are frustrated, for example they see a rabbit over the fence that they want to chase. 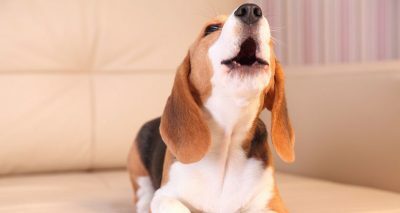 Others bark at passersby or bark as social communication to attract attention. Dogs with separation distress show anxious body language that occurs when they are alone. Video footage can be helpful for diagnosis. We recommend a thorough behaviour assessment to develop a treatment plan for your dog. Attempts to desensitize dogs to pre-departure cues by scrambling or avoiding the usual cues eg. donning work clothing, picking up of keys, rarely works as the dog quickly learns the new cues. Training to gradually increase the length of the departure is generally tedious and unsuccessful. It can be helpful to initially stop fueling the fear by not leaving your pet alone all day. Consider options for day care. Take your dog for lots of exercise. This could be in excess of an hour in the morning for some dogs to enable them to become tired and fulfil their physical and mental needs. Hold the morning meal until you leave. Use a non-performance ration. Act happy as you leave rather than communicate worry. Use the ‘wait’ command before feeding. Present the morning meal, which is half the dog’s daily ration in multiple food release toys or puzzles eg. 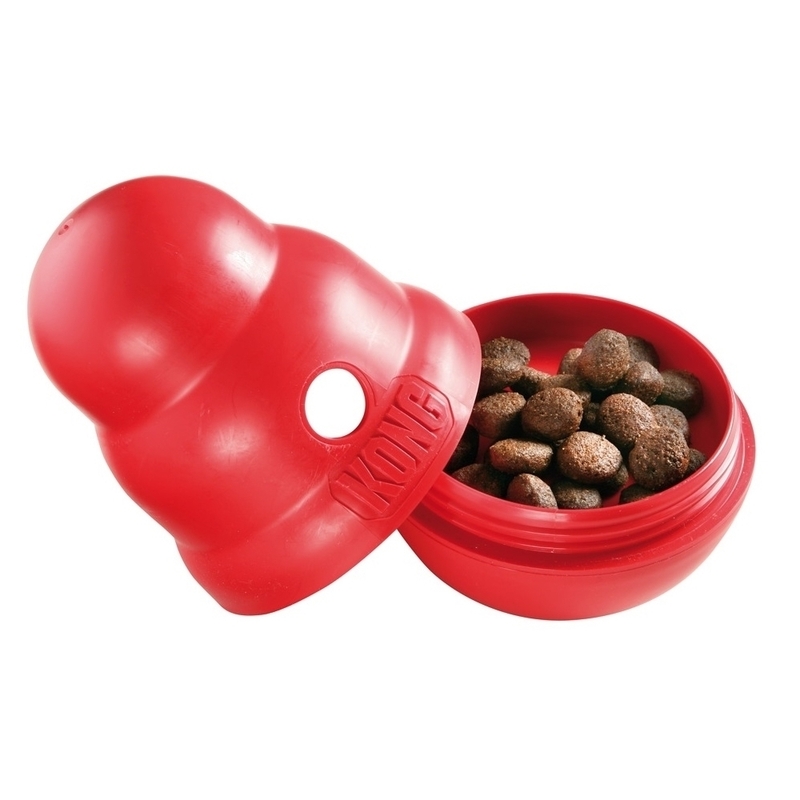 Kongs, treat balls, wobblers, frozen treats or hide the food as you leave. Make your leaving into party time! Leave your pet with an optimal environment. Appeal to your dog’s sense of taste. This will be different for every dog. Some love dried liver powder mixed with the food. Appeal to their sense of smell to provide interest. The smell could be associated with a chew toy eg vanilla, anise or an animal odour. Appeal to their sense of vision. For example, provide a bird feeder to watch, access to a view, dog TV, a dog door to access inside and out. Appeal to their sense of hearing. Play a CD going of sounds your dog may like eg “Through a Dogs ear”. Appeal to their sense of touch. Provide a comfortable resting place. Put some of your unwashed clothing in their bed. Crates that represent a safe refuge can be provided, however leave the door open. Your return must be very low key. Pick up all the uneaten food and items that you left at departure. The party is over. Wait an hour before feeding the evening meal. Ignore demanding attention seeking behaviour. When you start to ignore attention seeking behaviours, the dog may increase their attempt to get your attention. Take care not to reward this heightened behaviour. Remember that saying ‘No’, speaking to your dog, looking at them or pushing them down represents attention and rewards the behaviour. Reward calm and independent behaviour. Foster clear and consistent routines where your dog sits to receive good things in life. If they sleep on your bed, teach them to sleep in their own bed near to yours. Use a tether initially if they keep jumping up with you. Provide them with lots of exercise, off leash where possible. Make theirs an interesting life. Are they suitable for agility? Do they enjoy training or tricks? One of the most important goals in behaviour therapy is to reduce the underlying anxiety so learning can begin. Some anxious dogs are unable to learn new strategies to cope without medication as they have a physical illness. Whilst medication usually does not work without avoidance or fear triggers and the use of behaviour modification, it is often very helpful to reduce anxiety to a level that allows a starting point for retraining. Background and situational medications can play a large part in the management of separation anxiety and the vet will discuss these during a behaviour consultation. 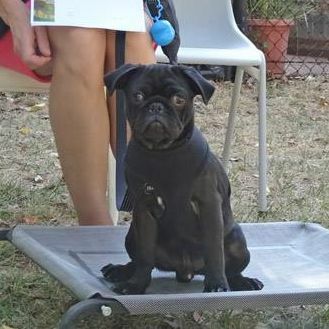 Frankie is a very excitable and wriggly 5 month old Pug puppy that came in recently for desexing. 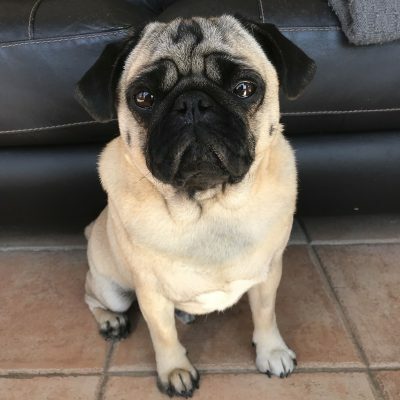 Frankie is very lucky, as his owners are well informed about some of the breathing problems that Pugs and other squishy faced (Brachycephalic) dogs such as Bulldogs and Boxers are prone to getting. 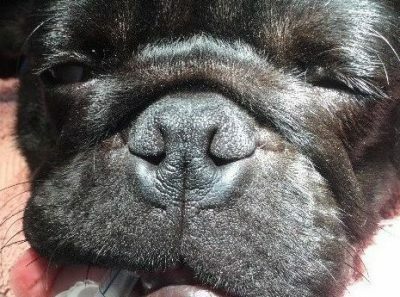 Because of the excess soft tissues in their airways dogs with squished faces can have great difficulty breathing. It can even get to the point where these dogs collapse and need oxygen support and emergency treatment after something as little as a short walk on a warm afternoon. So, while he was in for his desexing, we checked Frankie over to make sure he wasn’t going to have problems in the future. Frankie had very narrow nostrils which makes it much harder to breath in oxygen, and the effort of breathing in through narrow passages changes the pressures throughout the airways and lungs. Early intervention is key as these pressure changes can cause long term complications. Try pinching your nose and then breathing through it, and then imaging breathing like that all the time, even when excercising. It’s certainly not comfortable, and can cause great distress for affected dogs during exercise, times of high temperature, and periods of stress. While Frankie was under anaesthetic for his desexing, we surgically widened his nostrils. You can see the difference in his before and after photos below. The good news is Frankie can now breathe more easily making him much happier and more comfortable. Frankie woke up as if nothing had happened and wanted nothing more than some food and some cuddles! Chocolate toxicity: Keep your dog safe this Easter! With the approach of Easter, your chocolate stash is likely to grow. Like us, dogs love chocolate and will go to great lengths to search it out. 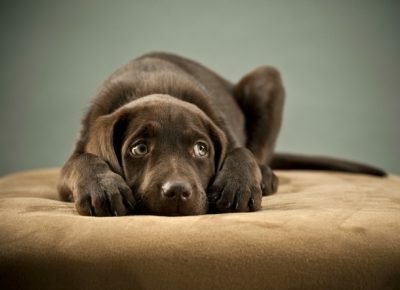 Unfortunately, for our four-legged friends, eating chocolate can cause serious illness. Why is chocolate toxic to dogs? Chocolate contains caffeine and theobromine. Whilst the amount of theobromine in chocolate is safe for human consumption, dogs take longer to process it, allowing the theobromine to negatively affect the dog’s heart, kidneys and brain. That depends upon your dog’s weight and the type of chocolate. Smaller, thinner dogs or dogs that are unwell are more at risk. Generally, the darker, the chocolate, the more theobromine it contains. White chocolate does not have enough theobromine to be toxic, but milk chocolate and dark chocolate can contain dangerous theobromine levels. Cocoa powder and cooking chocolate have the highest amounts of theobromine so be sure to keep these well out of reach! Some dogs are more sensitive to this toxin than others. As a rough guide, mild signs like vomiting and diarrhoea can occur with theobromine doses of 20mg/kg. Serious effects on the heart can start to occur at doses of 40 mg/kg and seizures at doses around 60mg/kg. Doses of 100mg/kg can be lethal. Theobromine makes up around 1.9 mg/g of milk chocolate, 5.5 mg/g of sweet dark chocolate and 16 mg/g of cooking chocolate. This chocolate calculator works out the toxic dose quickly and easily. Who would have thought that the fatal dose for a 5 kg dog is just 30 grams of cooking chocolate or a tablespoon of cocoa powder! 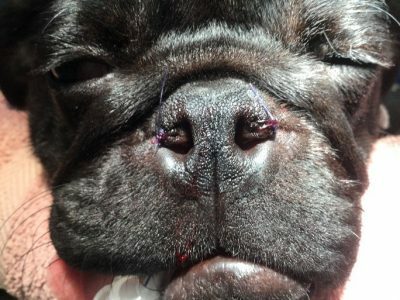 How are dogs treated for chocolate toxicity? This is an emergency! Bring your dog to the vet immediately as we need to induce vomiting within an hour to remove as much of the chocolate from the stomach as possible. Don’t be tempted to try to induce vomiting using home remedies as these can have serious adverse effects. We may administer activated charcoal to reduce gut absorption of the toxin. Additionally, IV fluids help remove theobromine from the body and prevent dehydration. With treatment, dogs with mild signs recover in 1-2 days. Dogs with seizures, muscle twitching or an abnormal heart rhythm will need more intensive treatment. Other ingredients in the chocolate like the high fat and dairy content can trigger illnesses ranging from a bout of gastro to serious pancreatitis during the following week. Chocolate is actually more toxic to cats than dogs however poisoning in cats is rare. Be sure to store chocolate securely to keep all your pets safe. If you suspect your dog has ingested chocolate, please call us immediately at Hall Veterinary Surgery on (02)62302223 for advice. Animal Emergency Centre in Fyshwick on (02) 6280 6344. Please note: The information on this website is of a general nature only and in no way should replace a visit to the vet with your animal.